I’m on to an experiment. On playing big. No more griping about why I hate this country. Won’t poke fun at the Filipinos’ bizarre habits. Won’t even write another word about exasperating _________. You see, I’m suddenly noticing a mass of Pinoy self-flagellation. We like to goof around on ourselves: on our being Filipinos; on our country’s folly; endlessly critic what doesn’t work; and then mock the sorry state of our nation. That may be the reason why “It’s More Fun in the Philippines” is having such a heyday. As Felipe de Leon put it: “We have been belittling ourselves and have become the worst self-bashers in the world.” I’ve never seen a citizenry having so much fun at its own expense. I was tempted to start writing about our cult of smallness. And realized that I would merely be reaffirming my point. I was going to self-bash on Filipinos anew. But what if I begun celebrating grand-ness. Tell you how I, along with many other Filipinas have always been proud about my brown skin instead of grumble about whitening soaps again. That I could easily love the name Mayumi and would have been happy to name my daughter that. Or maybe, that I read Filipino literature to my kids, and that they dote on Ines Kannoyan equally as they worship Cinderella. Even tell you about exquisite artisan treasures I saw at the export fair. I would have bought the entire exhibit except that the foreigners manning the booth wouldn’t let me. They were zealously guarding the prized Filipino crafts, wary of a Filipina who had uncovered their little secret. We don’t need “stateside.” They make them here! And as Felipe de Leon said, what if we begun to celebrate our country’s triumphs instead of our defeats? Stop recalling the botched up bus hostage rescue and instead revel in every Filipino rescue that happens as I write. Or what about considering heartening stories as newsworthy too? We’re fascinated with death and destruction. Soak up on stories of misery (including sobbing actresses.) Why is that? I am tired of hearing stories about our country’s wretched poverty, the violence happening in all sectors, corruption, yes, death and destruction. We are fond of rendering this country hopeless. That, or we just stay in our cynicism. Maybe, a new way of looking at things is in order. Instead of lamenting the negative, polarized, oppressive institutions that no longer work, why not exalt the stories that inspire? And I say we should remove all those tilted statues of a bound-up Rizal being shot. Even that of a terrified Ninoy going down the tarmac. Why show them in their most vulnerable and dying moments? 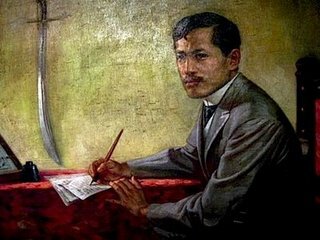 Let’s have Rizal sit erect, pen in hand, showing off his slick mustache. And please, let’s stop all the copying. Do we have to bear another cheesy movie or hear another screechy song? Why copy crap? This time, let’s try to really define ourselves, on our own terms. Can someone please remind us and play “American Junk” on the radio again? We’re such an imaginative race. Really. We need to resurrect the likes of “Pumapatak Ang Ulan.” Want another proof of creative? Just look at the stream of very inventive “It’s More Fun in the Philippines” anecdotes. We may be 14th most happiest in the world but please let’s not laugh at our expense. Don’t let the joke be on us. Let’s try this time, to think big. Grand-stand. As Marian Williamson puts it ”you’re playing small does not serve the world. There is nothing enlightened about shrinking.” This cult of smallness has not served us at all. And there’s no other thing to do in this darkness except light a candle. Some people might call it new age-y but I do think we do create our own realities. Nick Perlas says: “a nation’s pessimism tends to be a self-fulfilling prophecy.” So why not be more deliberate about thinking big? And so, I’m onto an experiment of imagining and creating grand things for this country. And I’ll do my best to make it #1forFun. Please remind me when I go back to self-loathing. Great write Paw. A breather in amidst all the noise. thank you! we need to start thinking this way!